The World XI has Arrived in Pakistan to play 3 T20 match series in Lahore.The Long awaited dream of Pakistanis is now about to happen in reality.Only Five Members Of Pak Team have played against an International team at home before this.The Series is level with 1-1.In The 2nd match, World XI Win by 7 Wickets.Amla Played A beautiful Knock of 72.So the final and 3rd t-20 Match of azadi cup is set to be played On 15th September 2017 at lahore. 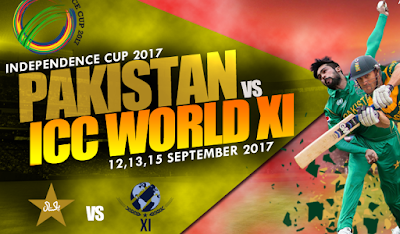 You can get today match prediction from this great platform free and this match of Pakistan vs World XI is on Sep 15th, 2017. Today Independence Cup Pakistan vs World XI match will be playing in Lahore. Sarfraz Ahmed(C&Wk), Ahmed Shehzad, Fakhar Zaman, Faheem Ashraf, Imad Waseem, Hassan Ali, Muhammad Aamir, Ruman Raess, Shoaib Malik, Umer Amin, Babr Azam, Sohail Khan, Usman Khan, Shadab Khan, Ammer Yamin. Faf Du Plessis(C), Paul CollingWood, Hashim Amla, Darren Sammy, Tim Paine, Ben Cuttings, Tamim Iqbal, Morne Morkel, George Bailey, Imran Tahir, Grant Elliot, Samuel Badri, David Miller, Thisara Perera.